We docked in Bagan where we spent the day exploring this site of the more than 3,000 Buddhist temples and pagodas. 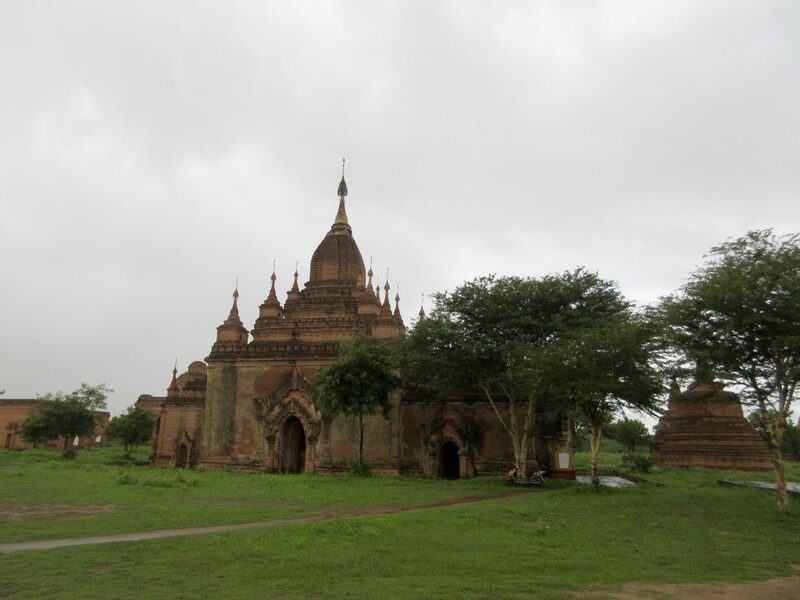 Between the 9th and 13th centuries, the city was the capital of the Pagan Kingdom, believed to be the first kingdom to unify the regions that would become modern Myanmar. During its height between the 10th and 13th centuries more than 10,000 Buddhist temples, pagodas and monasteries were constructed in the Bagan plains alone. It is believed that as many as 200,000 people once lived in this area. Unfortunately, this area is prone to earthquakes; as recently as August 2016 an earthquake destroyed some 400 temples. In Myanmar it is the end of lent and they have not been able to marry or have any celebrations for the last three months. 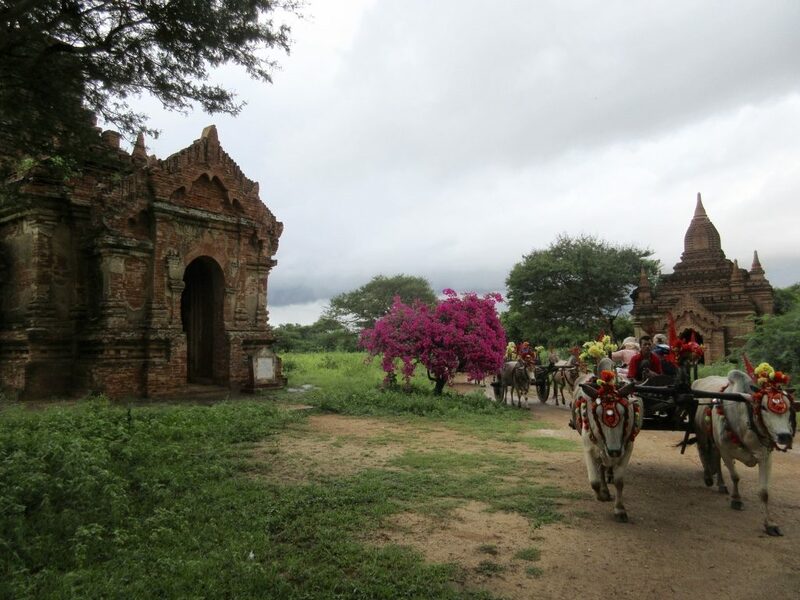 Now that the full moon has arrived and lent is over, many of the Burmese people are making pilgrimages to the area of Bagan to visit some of the local temples. They are coming from all over the country in busses, in the back of pick-up trucks and on all forms of transportation. Many of the local nunneries and monasteries allow the pilgrims to stay on their grounds. There are many food stands along the roads and people are selling souvenirs on the roadsides. Traffic in some areas is very congested and the most popular temples are extremely crowded. 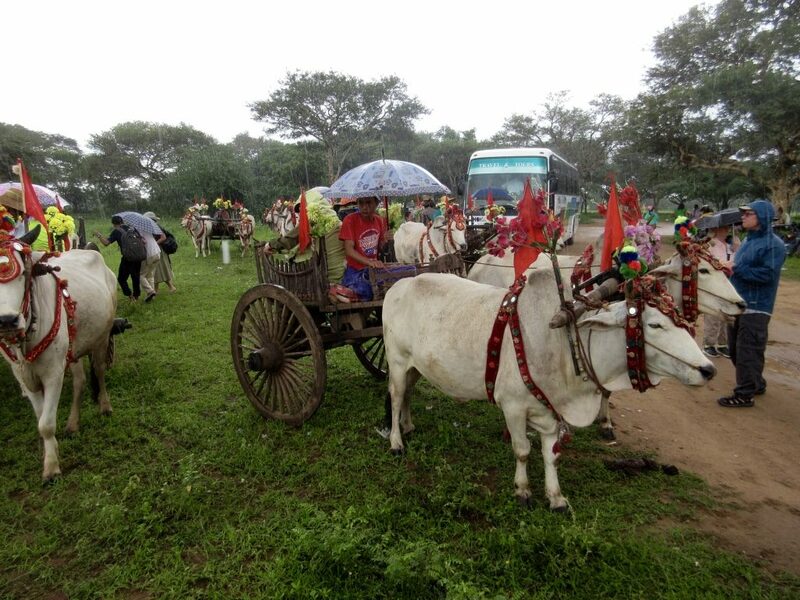 First, we took a ride on an open air oxcart where we meandered along a dirt path to admire a large number of temples. Most of these temples were built of red clay brick and then covered in a plaster with additional ornamentation. Today most of the temples have weathered enough so that all that remains are the brick structures and a few remnants of the plaster outer layer. We visited Htilominlo temple that is decorated with the finest plaster carvings and murals which remain. Most of the remaining murals are on the ceilings where they were better protected over time. 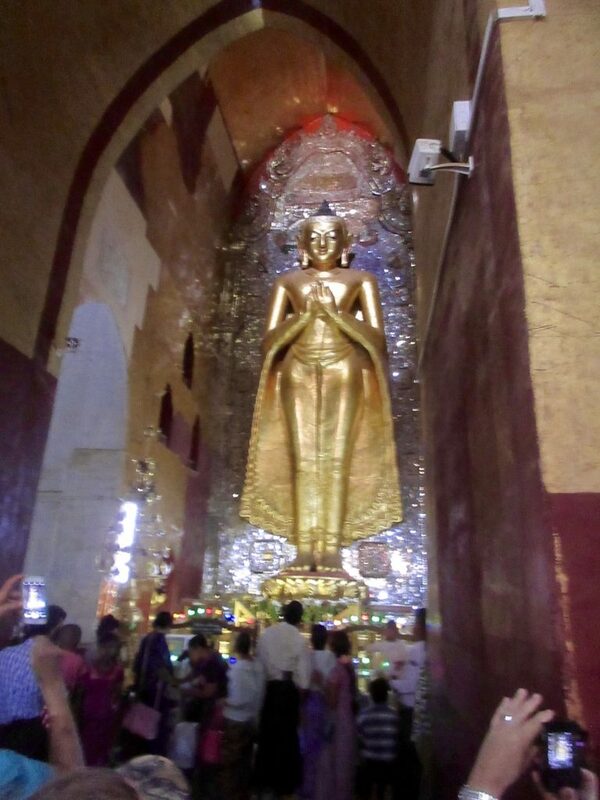 All of the temples are unique in their architecture and size, but they all are similar in that they contain at least one large Buddha statue. Most of the Buddha statues are made of brick and plastered over to create a smooth surface which can then be painted or gold leafed. Most of the Buddha statues are painted white and the facial features are enhanced with red lips and black paint to define the hair and to outline the eyes and eye brows. The Buddhas are the main interior decoration of the temples in most cases. We then visited a temple by the name of Ananda built in the year 1102. This temple was built with four main entrances, one each facing north, east, south and west. At each entrance there is an enormous standing Buddha and this is one of only four remaining temples from this time period. The Buddhas are all covered in gold leaf although each of them is unique to itself in facial expressions, position of the hands and ornamentation. In the afternoon we stopped at a workshop where we learned about the ancient Burmese lacquer ware techniques. 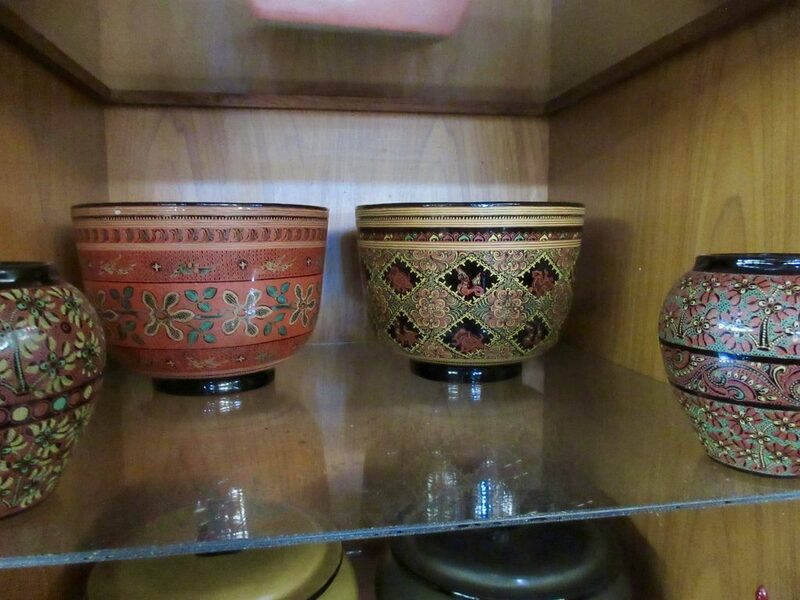 The lacquer ware technique is believed to have come to Burma from China in the first century. Traditionally fine lacquer ware bowls were produced using a combination of horsehair and bamboo to make them very flexible. Lacquer ware is crafted from a mixture of the juice from the Thitsi tree and ash applied to the surface of the object made of woven bamboo or wood. There are more than a dozen steps in the process so it often takes six months or more to complete the items. Successive layers of lacquer are applied to the object to eliminate any irregularities and then dried several days. When fully dry, the surface is polished to a smooth finish and ornamental and figurative designs are added to enhance the object. The most popular color of lacquer ware is black but you do see some in red, green, yellow and even some with multiple colors. We then visited another area with a cluster of smaller pagodas, typically with just one small inner room housing one Buddha. Many of these were built by local families that lived in the area. They would have needed permission of the King and would have been told how large of a pagoda that they were allowed to build. Those who were more affluent and wealthy were allowed to build larger and more elaborate pagodas. Just before sunset we headed for a temple with four levels of terraces called Shwe San Daw where we climbed the steep stairs to the third level to enjoy the sunset. The temple was extremely busy with pilgrims and tourists who all converged here to enjoy the views from the terraces over the flat plains of pagodas and temples. Unfortunately, the sunset was not that spectacular due to clouds, but the views were very nice.